Fighting Parkinson's Drug Free | Embracing the disease from a new perspective. Are you or someone you know suffering from Parkinson’s Disease? Do you know much about the disease? Have you been talking to family and friends looking for answers? Have you been researching the internet searching for answers? Have you become frustrated with what you have found and want something more? Whether you are fighting Parkinson’s without medications or fighting Parkinson’s with medications, everybody is welcome here! Fighting Parkinson’s Drug Free presents a holistic approach to embracing the disease from a new perspective. Howard Shifke recovered from Parkinson’s Disease using a holistic approach to recovery that he designed. The approach is called his Parkinson’s Recipe for Recovery®. Howard fought Parkinson’s without medications, herbal supplements, herbal formulas or Ayurvedic remedies. His recipe for recovery is outlined in his Blog post dated January 5, 2011, and it is a combination of Qigong, Traditional Chinese Medicine, Acupressure, Soul, Mind, Body Medicine, Chanting, Jin Shin Jyutsu, Yin Tui Na, a vegetarian diet, and many meditation/affirmation/prayer techniques. 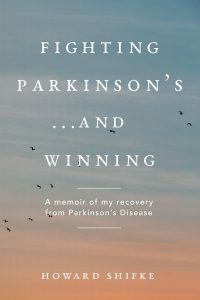 Through trial and error, he was able to discover what worked and what did not, and he explains it in great detail in the Blog as well as in his book, Fighting Parkinson’s…and Winning. Click the image of the book for more information, including how to purchase the book. September 21, 2009, Howard’s internal tremors began. November 5, 2009, Parkinson’s diagnosis by neurologist. Parkinson’s symptoms Howard fought included: Internal tremors; Extremely poor balance; Bradykinesia (walking — hunched forward, shuffled feet, arms did not swing); Rigidity (arms, legs and upper back were tight and extremely painful); Constipation; Inability to stand up straight; Inability to get out of a chair without using arms; Inability to go up and down stairs without holding railing and using arms to pull self up; Inability to get a utensil to his mouth when trying to eat; Falling asleep in middle of the day sitting at the computer; Frozen face; Inability to write; Inability to type with two hands; Constantly worn out and tired. June 12, 2010, Howard became symptom free. August 5, 2010, Parkinson’s neurologist could not detect a single Parkinson’s symptom. December 22, 2011, Parkinson’s neurologist states Howard does not have Parkinson’s anymore. Today, Howard remains symptom free, Parkinson’s free. Great news! Another person, Marie, who has been doing my Parkinson’s Recipe for Recovery® is symptom free from Parkinson’s as well! Click here to read all about it. More great news! Another person, Pratima, who has been doing my Parkinson’s Recipe for Recovery® is symptom free from Stage 4 Parkinson’s! Click here to read all about it. Even more great news! Another person, Betty M., who has been doing my Parkinson’s Recipe for Recovery® is symptom free from Parkinson’s! Click here to read all about it. And, even more great news! Another person, Helen Gill in Australia, who has been doing my Parkinson’s Recipe for Recovery® is symptom free from Parkinson’s! Click here to read all about it. Yes, continuing great news! Another person, Tony C., who has been doing my Parkinson’s Recipe for Recovery® is symptom free from Parkinson’s! Click here to read all about it. On this web site you will find Howard’s Blog, which chronicles his story sharing his holistic approach to Parkinson’s, as well as the resources where he learned the information to build the recipe that resulted in his recovery. Also, you will find testimonials from some of the Parkinson’s sufferers who Howard is coaching, and a Parkinson’s coaching page explaining how you may enlist Howard’s Parkinson’s Coaching services.